HERITAGE CENTRE OPEN DAYS, Upcoming Events and What’s New? What’s New? – Last July we published the first poem – a recollection by an American Fighter Pilot, who flew from the New Forest Airfields. This page will be added to, as time progresses. Check out the ‘Fighter Pilot Memories’ page of the website to read this poem. Heritage Centre entry is either free, on production of your FONFA Membership card, or via a cash donation for non-Members of a Minimum £7.50 for adults and £3 for 10-16 year olds (Entry is Free to ‘under 10s’). Service Veterans (pre-1961) are admitted at a concessionary rate of £3, on production of their Service ID. N.B New Members joining in October will receive Membership for the whole of the next calendar year. A donation of £10 gives visitors to FONFA Membership for the current calendar year (an unlimited number of visits on Open Days and other events) and regular Members’ Newsletters, if you wish to become a member. More dates will be added as events are arranged. 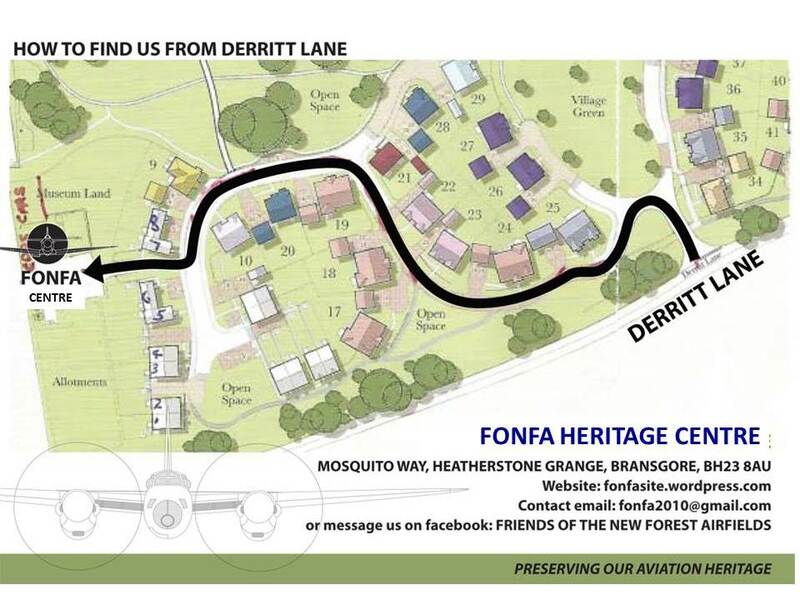 Enter the Heatherstone Grange estate from Derritt Lane and turn immediately left; follow the road roundthe estate, turning left again at the T-junction and then right into Mosquito Way. The Centre is then ahead on your right. Please be aware that we are required by law to have two trained Fire Warden Trustees on site, whenever members of the public are admitted. The Trustees, who are all unpaid volunteers, are willing to consider requests from groups of ten or more adults, to visit the Museum on mutually agreed days. We will do their best to accommodate such requests, in addition to our normal Outreach Programme for visits by local school parties. Future Change of Address & New Postcode: It may be next year before a correct Post Code is entered in all SatNav databases, so for SatNav users, the old postcode BH23 8AU is still appropriate for the Heritage Centre building until further notice. If you would like to join FONFA as a new member, please see the Enrolment Form under the headline ‘Join Us or Make a Donation’ at the top of the Home page.